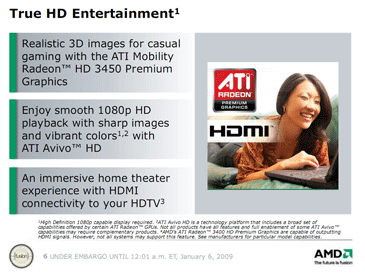 AMD Athlon Neo: Cost Effective Powerful Mobility? It's like a marketing buzzword masterpiece, or mayhem, depending on which way you look at it, but having tried to sum up what AMD is aiming for in its new Athlon Neo product is difficult to say the least. 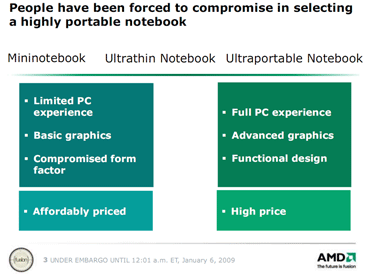 AMD didn't want to just "make an Atom" - jumping in an Intel bandwagon when it's never been strong in the mobile realm is not an idea that AMD seems to relish, and besides, most of the Silverthorne team designing the Atom CPU were reassigned from the fabled Tejas project in 2005. 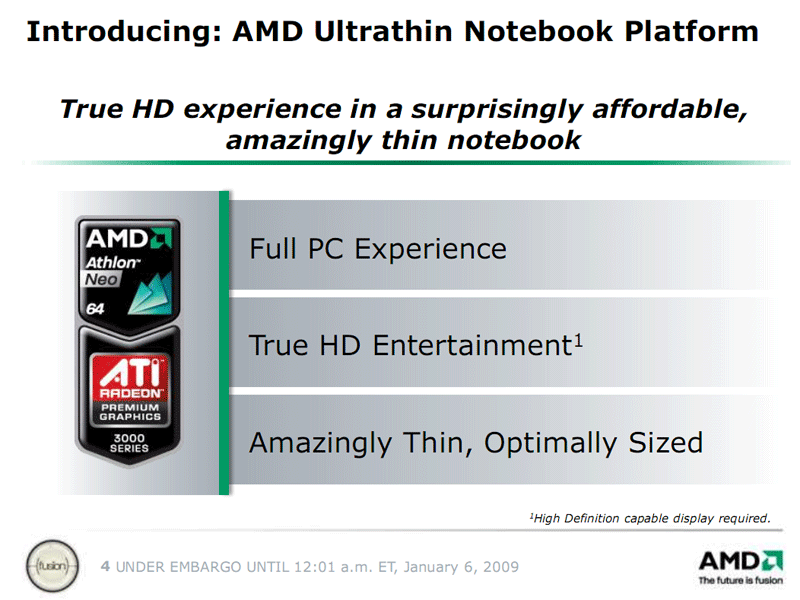 This would mean for AMD to design a "true" Atom-esq CPU, it would have to think three years ahead. 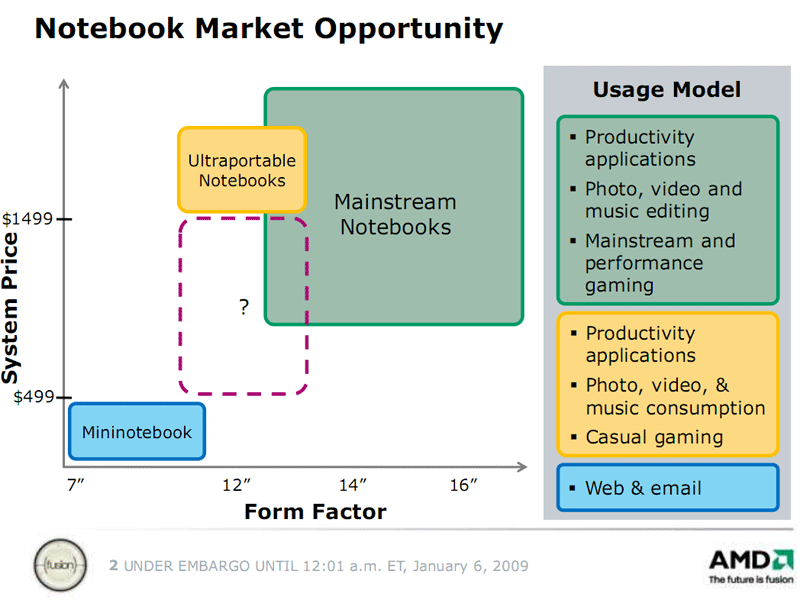 Regardless of this fact, AMD has good reason to avoid it: AMD is targeting the ultra-thin ten to 13-inch, $499 to $1,499 segment between sub-$499 netbook and big, clunky mainstream notebooks. 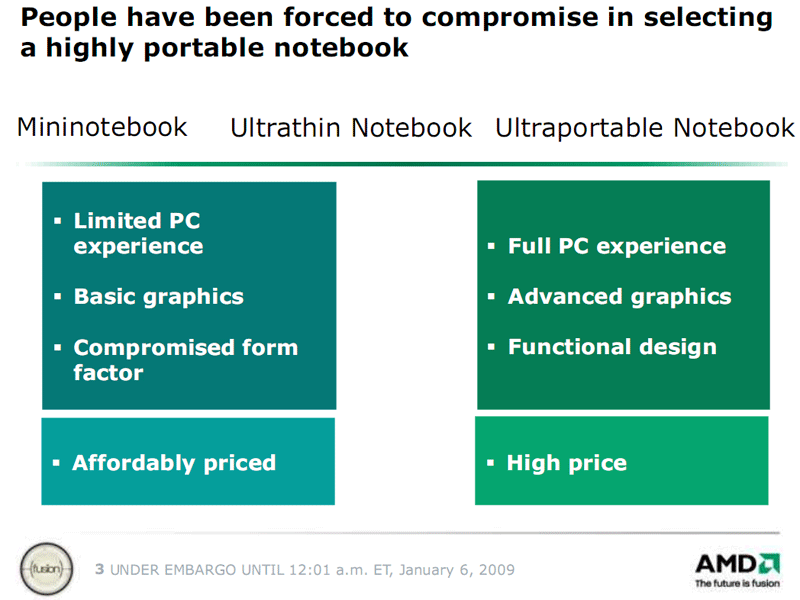 It's a brave move, but we think it's a clever one - if you look at any cheap notebook now on sale it's either 15.4-inch brick with a mix of cheap parts or an ultra teeny netbook that's barely capable of running video, let alone do two things at once. There's nothing "inexpensive" but also quite powerful - enough to be really productive: multitasking, editing photos (the one thing that has personally stopped me getting a netbook: Adobe Photoshop), and just the few things that are a bit more intensive than basic computing. 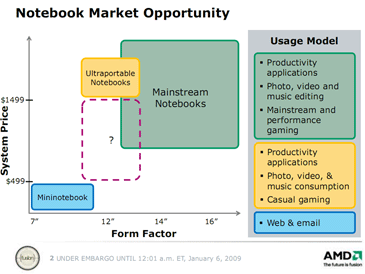 To get a good ultra-thin solution it's either a netbook like the Samsung NC10 or Acer Aspire One or, at the other end of the scale, it's a Sony TZ, Lenovo ThinkPad X300 or Macbook Air - there is literally nothing inbetween. The launch speed matches the Intel Atom and the cache sizes are business as usual for an Athlon K8 CPU, however the 15W TDP is significantly more than the Atom's 4-8W, but remember the Neo has more cache, an integrated memory controller and importantly - out of order execution for much improved performance. All these increase the transistor count and heat generated, not to mention the 65nm SOI fabrication versus 45nm High-k Metal Gate that Intel uses. Interestingly, AMD didn't risk porting it to its latest 45nm process, which is a shame because it would have made it even more energy efficient, smaller and cheaper to produce, but knowing AMD's history with attempting to juggle more than a few balls - it would probably have arrived this time next year. Responding to rumours that Pine Trail - the next iteration of the popular Atom processor range - would be delayed until 2010, Intel has stated that the chip is well on track for a 2009 release.